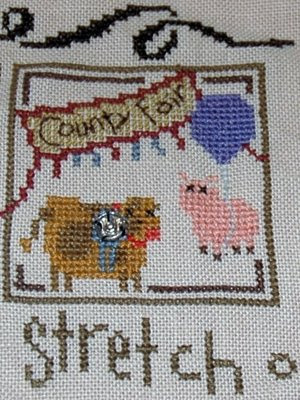 Bits of My Own: County Fair is Finished! This one was not one of my favorites, but I think it will blend well into the whole design. Not the best picture, but it is getting harder to take such wide shots. There are 3 more little boxes left. The next one in the series is Wreath. Lovely little square, looks great with the others and not far to go to finish. I think County Fair is cute! The whole piece is looking super. County fair is cute. Love the little pink pig. Wow, and you are almost done. I know taking pictures of big pieces is really hard. 'Tis the Gift is Finished! The Best Thing about July! Illuminated House Blessing is Finished!